It’s official. The mojo has departed. And because it’s the triathlon enthusiasm that has gone, it means that it’s not just not running, swimming and cycling also hold no appeal. My bike is sitting forlornly on the turbo trainer, its pointy saddle hurting no bottoms. My trainers are unworn and my spikes have yet to be used on a cross country course or competitors toes. I don’t even fancy wee-ing in my wetsuit. However, it appears that I NEED to get back to it. If only because what I have replaced it with is much MUCH worse. And it appears that I'm even more rubbish at DIY than I am at Not-Faffing-Around-In-Transitions and Self-Control-Around-All-The-Food-At-Checkpoints. At least with the checkpoints and eating all the food, the worst thing that happens is that I waste time and put on weight. Poked a hole in the roof of the house. (Yes really) I tried to cover it up but it was too big. I was only trying to paint the porch. Dropped an entire tin of white gloss paint on the patio. I actually managed to clean it up quite well except I’ve managed to make a clean patch on the patio and it turns out that the patio stones AREN’T actually beige like I’ve always thought but are pink and yellow. Well. 4 of them are because I cleaned them trying to clean the paint up and now I have a beige patio that looks like Mr Blobby has melted in the middle. Dribbled paint down the windows. From the inside it looks like I've installed bars. Dropped white paint down the red brickwork. Tried to cover it up with ‘Raspberry Delight’ - the only paint colour available in my local hardware shop paint samples that was anywhere near brick colour. Turns out it’s NOT near brick colour. I now have white and pink striped bricks. It’s like living in a candy cane house. But one with barred windows and a hole in the roof. White gloss in both my ears and in my hair. It is never coming out. I have resigned myself to being partially deaf and with white striped hair. It’s like being 80 years old but without the pension, massive knickers and small yappy dog. White paint is also in my wellies, on my house keys and I’ve just found a white spots on the car bonnet. So for the sake of NEVER being able to sell the house OR the car now, I really need to start exercising again. I need to wear myself out before something dreadful happens. Like an attempt at interior decoration or a newfound passion for taxidermy. 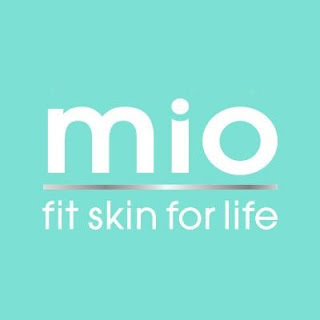 Review: Mio Skincare sent me the products to review. I said exactly what I thought and I wasn't paid to review these ... trust me, I'm a runner. I like the idea of being one of those ladies that has facials and perfect nails and who has a glass of wine and who lunches. Facials? I love the idea but the closest I get is a faceplant in mud after a trip at a trail run. (It’s PRACTICALLY the same stuff, right? Except for the grass and bits of straw …) And I’m not sure I can EVER boast perfect nails when I permanently have less than 5 on each foot. And wine with lunch? Nope. I’d be running into trees on the lunchtime run if I hydrated with wine! I like the IDEA of being one of these perfectly turned-out ladies but I’m just too busy actually doing things and there’s just TOO MUCH MUD. And falling over. A lovely, fresh fragrance - mint and cucumber - it smelled clean without being overpowering. I was impressed with the strength of the wipes - these wouldn’t break if you wanted to clean up with these after a workout but they’re also biodegradable. They are sealed individually so they keep the right amount of dampness - so you can clean about without staying sticky and you dry quickly compared to a wipe with a baby wipe or soap / water so no towel required. The wipes are about 2/3 larger than a standard baby wipe so a nice size and great for removing makeup before a workout. If I was to use a swipe instead of a shower, you would probably want to use 2. I liked these although I felt they were quite pricey as you’ pay just over £1 per wipe if you bought the Clean Slate Workout Swipes. However, if you don’t have access to a shower, but want to keep your lunchtime workout sessions then these would be a good alternative. Did it do what it said? Probably not for the price although I loved the smell of them and thought they were a good product. Ideal before and after any exercise or when you need an rapid blast of revitalisation. It boosts you into action so you get the best from your workout and then helps you recover by infusing your skin with its incredible uplifting cocktail of herbs and extracts. Rapidly cooling and revitalising with V-Tonic TM, extracts of Arnica, Horse Chestnut, Murumuru Butter, Spearmint and natural Magnesium to pep-talk your muscles, helps ease aches. Smells amazing too! It smells lovely - very spearmint and fresh - and I really liked the zing it gave my skin after I applied it. It feels nice and smooth and rubs in well. The lotion is very easy to apply and it’s lovely as a body lotion even if you aren’t heading for a workout. I’m not convinced it gave my legs the pep-talk promised (!) but it lifted my mood and it was a lovely cooling treat after a hot shower. Lovely as a body lotion and it certainly did smell amazing - very minty and fresh and it gave my legs a nice tingle after a workout. I would buy it as it’s a lovely treat after a hard workout. It’s quite pricey if you use it as a body lotion but it would make a great present for a runner or gym bunny. Liquid Yoga is your personal masseuse in a bottle; helping relax tight, stressed shoulders and soothing tired, achy bodies. No other bath treatment is as rich in incredible actives. Magnesium-rich Epsom salts and Arnica and our heady blend of V-Tonic™, spearmint, cypress, lavender, mandarin and chamomile essential oils help to ease your stress and anxiety, plus moisturising, Murumuru Butter so your skin feels as good as your mind upon stepping out of the tub. Importantly, it is Sodium Laureth Sulfate and Sodium Lauryl Sulfate (SLS) free. I LOVED this. It was a lovely fragrance and it made my bath feel quite luxurious - once I’d shut the 6 year old out of the bathroom and given the husband strict instructions not to disturb me. The bath felt very relaxing and moisturising and it really did feel like a treat. As an additional bonus, the fragrance made the bathroom smell wonderful for several hours afterwards. Yes. Very relaxing and moisturising. From their website: We have created this range of incredible bodycare to be the very best in the business, giving you fit skin that can easily cope with all the challenges life throws at us. In our experience as women, we all want skincare that is as free of any nasties as possible, but we also want skin that actually WORKS.we do not use… parabens, petrolatum, mineral oil, synthetic fragrances, artificial colourants, sodium laureth or lauryl sulphate, xenoestrogens, phthalates, PEGs or glycols. I found the products quite pricey compared to those I usually buy, but I loved the fragrances and was impressed with the reviews on the site and when there was one that wasn’t so favourable, that the Mio founder had personally responded to the comment to resolve the problem. There's also free shipping on all products.